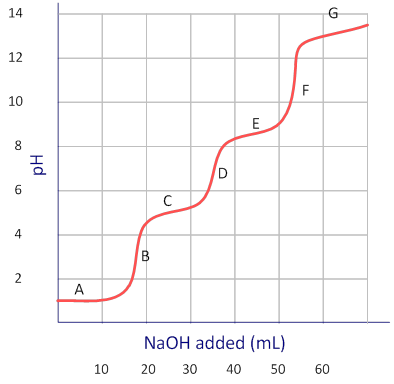 Using the titration curve of phosphoric acid, find the equivalent point(s) and select the corresponding letter. Phosphoric acid (H3PO4) is a polyprotic acid that produces 3 moles of hydrogen ion per mole of acid, and therefore has 3 equivalence points. They are the steepest points on the graph at B, D, and F.